The Credit River runs through the heart of southern Ontario, Canada. The Credit boasts large runs of chinook salmon and steelhead as well as some coho salmon, and Atlantic salmon. The headwaters of the Credit also offers many fly fishing opportunities for resident brown trout and speckled trout. The steelhead run on the Credit River begins in late August and ends in late May with peak runs occurring between October 15th and December 15th and between March 1st and April 20th. The runs are always timed after heavy rains or spring thaw. The most common method of fishing is float fishing with roe, flies and sometimes worms. Fly-fishing is next in popularity and a few anglers fishing with spinners. Floating fishing with 2-4 Salmon eggs tied in spawn sacs produces very well when the fish are aggressive. When the water is low and the trout are spooky, single eggs and flies are your best bet. 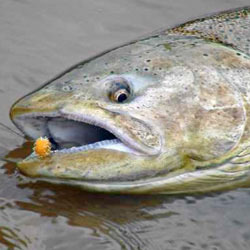 The fly patterns commonly used to catch steelhead are stoneflies and wooly buggers. The chinook fishery is extremely popular at the mouth of the river from late July to early October. Hundreds of anglers try their luck from the piers and boats. The first big salmon run usually occurs between September 8th and 18th every year. During cold summers or if there is a cold rain in August a run of fish may enter earlier. Salmon fishing is done at the river mouth by casting lures such as cleo's, crocodiles and other heavy spoons. A lot of anglers also bottom fish with roe or large white marsh mellows. In the river roe and flies are the top choices for anglers. Float fishing and bottom bouncing are most popular although some anglers enjoy fly fishing. 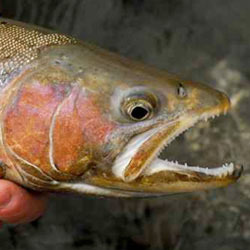 Fresh run fish are often aggressive and will take bright flies readily. Below the Streetsville Dam to Erindale Park sees most of the fishing pressure. Erindale Park situated in the middle of Mississauga is open to salmon and trout fishing all year and it produces a lot of fish. It is not uncommon to see 250 anglers in this section when a big run is on. Each detailed map provides depth, contours, structure, boat ramps, and updated fishing information. 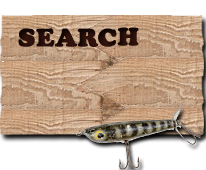 Credit River fishing maps also include lake info such as gamefish abundance, forage base, water clarity, weedline depth, bottom composition, complete latitude/longitude grid lines and dozens of GPS waypoints & coordinates.